Lamborghini duo Christian Engelhart and Mirko Bortolotti dominated the Blancpain GT Series Sprint Cup opener at the Hungaroring, beating pre-race favourite Mercedes. 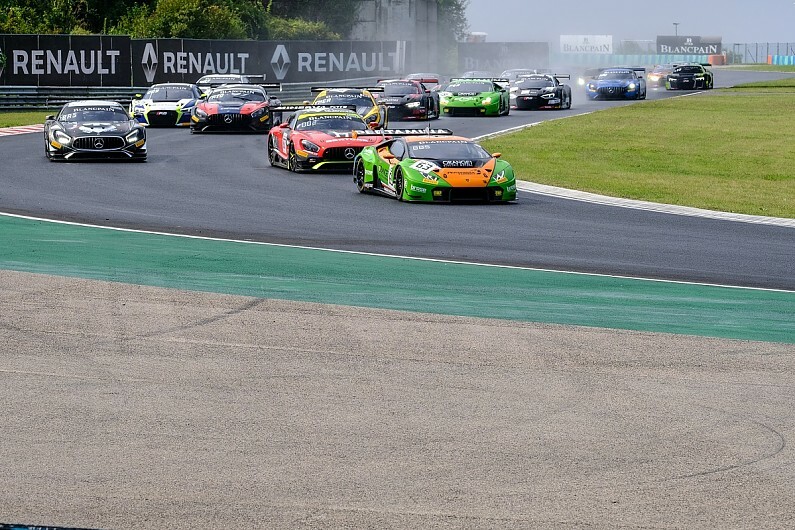 Engelhart launched his Grasser Racing Lamborghini Huracan GT3 into the lead just seconds into the race despite starting fifth on the grid. Heavy storm prior to the race left the track damp, and Englehart found superior traction to lead into Turn 1 while the polesitting #90 Mercedes fell to third. The #88 Mercedes driven by Raffaele Marciello and Michael Meadows proved to be its nearest rival. Meadows was the first of the frontrunners to pit and Marciello set a series of fastest laps in quick succession, passing WRT's Will Stevens on the inside of Turn 3 and the #90 Mercedes - now in the hands of series rookie Jack Manchester - later in the lap to climb to third. Marciello took over 10 seconds out of the gap to the leading Lamborghini and took second place when Russian Denis Bulatov spun the #87 Mercedes at the penultimate corner with only a couple of minutes remaining. Mercedes driver Marciello ended the race 4.743 seconds adrift of Bortolotti, the Lamborghini pairing taking their first win since the season opener at Zolder. The championship-leading #1 Audi retired from the race when Alex Riberas spun into the wall at the final corner after making contact with the wet-tyre shod BMW driven by Andrew Watson. Watson was the only driver to gamble on wet tyres at the start of the race. It initially paid off as he climbed from 11th to second place but he rapidly tumbled down the order and the car finished four laps down. Bulatov recovered from his spin to take the final spot on the podium ahead of the #25 Audi of Christopher Haase and Simon Gachet and WRT's Will Stevens and Dries Vanthoor. Ex-Formula 1 driver Christian Klien and Albert Costa had their best finish of the season in sixth position ahead of Manchester's #90 Mercedes. Reigning Sprint Cup champion Robin Frijns' miserable day continued when Stuart Leonard spun his #17 Audi on the way to the grid and later retired in the race. Despite a spin at the final corner, the #751 Mercedes took victory in the Pro-Am class.